As an essay on theatre, Bakkhai has it all. There’s doubling, role-playing, one thing standing in for another. There’s the clash of complex psychological insight and the wild, raw and visceral. There’s dressing up and fluid identities. And there’s the god of theatre himself Dionysos, shrugging on human form for a performance of his own. As theatre itself, though, it’s another question. It’s not that the Almeida’s production, directed by James Macdonald, is untheatrical. There are some brilliant visual snapshots, usually heralding the arrival of Dionysos and accompanied by Peter Mumford’s vivid bursts of light, while there’s an implicit, self-aware acknowledgement of the audience throughout. That’s not to mention the uncanniness of the whole thing, its determined strangeness. But the driving narrative of Dionysos, in a holy rage and determined to get his own back on the family who snubbed him, often feels oddly underpowered. That said, the two central performances are hard to fault. From the moment he saunters on stage, throwing a conspiratorial glance to the audience as he discloses his godly identity, Ben Whishaw is utterly in control. His long-haired Dionysos is sinuous, snake-like, ready to shed this latest skin at any moment. And damn he can rock a dress. This vengeful god-turned-human is slippery and androgynous, oddly delicate in his might. He doesn’t need the borrowed authority of masculine aggression; he is power divine, effortlessly enchanting his scores of female devotees and crushing kings with the lightest flick of his wrist. One such king is Bertie Carvel’s Pentheus, young leader of Thebes and a politician through and through. Where Dionysos is wild and uninhibited, Pentheus is rational and repressed, as buttoned-up as his immaculate suit jacket. Carvel, however, slips the suggestion of something else beneath Pentheus’s slick exterior, so that he bristles with latent curiosity even as he condemns the frolics of Dionysos’s followers. 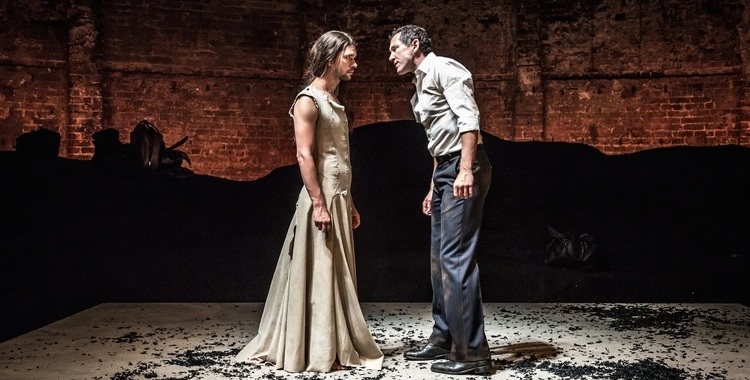 There’s a delicious scene between him and Whishaw in which the latter – posing as Dionysos’s human messenger – is persuading the disgruntled king to slip on a dress and spy on the bakkhai. Hesitancy barely masks eagerness, while a sly grin curls across Whishaw’s lips. When Carvel drags up, though, first in disguise to infiltrate the Bakkhic rites, then later as Pentheus’s blood-drenched mother Agave, there are unfortunate echoes of his revelatory Miss Trunchbull in Matilda the Musical. I was half-expecting a cry of “maggots!” as Agave rages in her grief. Whishaw, too, fares less well when he steps into other roles, his distraught and helpless messenger not half as compelling as the scheming god who pulls all the strings. In a nod to the conventions of Greek tragedy, the trio of actors is completed by Kevin Harvey, smoothly metamorphosing from old man Kadmos to younger citizens of Thebes, though often in the shadow of Whishaw and Carvel’s sparring partners. Then there’s the chorus. At first, the ivy-garlanded crowd of singers are startlingly other-worldly, their piercing, discordant wails a little reminiscent of the sculptural song of Return to the Voice. Just as Whishaw is an effortless deity, they really do sound like beings in communion with some strange elsewhere. After an hour and a half, though, their persistent chanting and spookily synchronised speech grates. There’s simply too much of their musical Dionysian worship, sharply putting the brakes on the momentum built up in each of the scenes between Whishaw and Carvel and never quite integrating with the rest of the action. The issue is essentially one of tone. Bakkhai is a collision of the civilised and the elemental, of the familiar and the strange. We get that here, but often those two conflicting registers don’t so much lock horns as awkwardly jar. And beyond Whishaw’s performance, there’s never a full, unleashed sense of the wild, whether in Antony McDonald’s tentatively earthy design or in the over-polished (and over-used) chorus. The ideas are all there, but theatrically it lacks the impact it’s straining for.